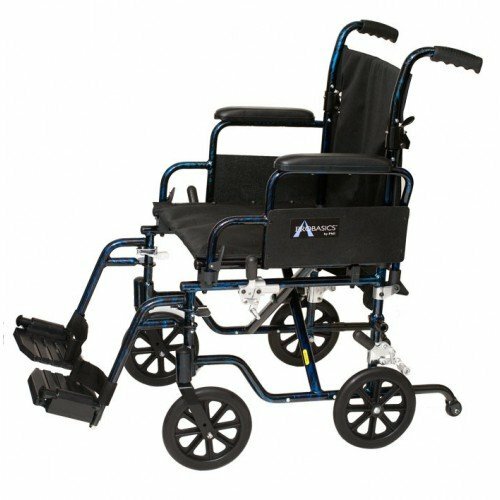 ProBasics Transformer Wheelchair by Invacare is a high-grade, dual-purpose, single-axle K4 wheelchair that easily converts from a self-propelled wheelchair to a compact transport chair. 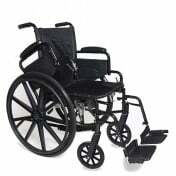 The lightweight, black, woven nylon upholstery offers comfort and durable support, with an accessory pouch sewn onto the back for added convenience. The ProBasics Transformer Wheelchair comes complete with two sets of lightweight wheel locks for both self-propelled and transport modes, as well as flip-back desk-length arms with padded armrests. 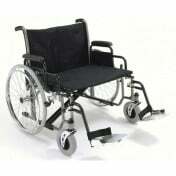 The footrests include heel loops and composite footplates for added user security. 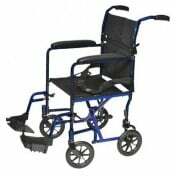 Vitality Medical also carries other items that would pair well with the ProBasics Transformer Wheelchair, such as the Invacare Raised 5 Inch Toilet Seat and Posey Fall Management Socks. Flip-Back Desk-Length Arms With Padded Armrests. Lightweight, Black, Woven Nylon Upholstery With Accessory Pouch Sewn On Back. 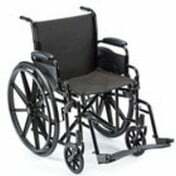 Footrests Include Heel Loops and Composite Footplates. 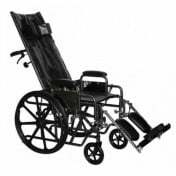 Fold-Down Back With Easy-Release Paddles. Are the footrests adjustable in length? The length cannot be adjusted on these.